Treasure Hunting Game is an outdoor activity which integrates GPS, GIS, and challenge and arouses students’ curiosity. Students can not only learn the applications of GPS and GIS but also gain the knowledge of local culture by observing, imaging, reading the local history placard, and finding answers. Therefore, Treasure Hunting Game is an extremely educational game. Treasure Hunting Game improves the interests of learning GIS effectively. treasure. Therefore, the game is enhanced and shows a corresponding interface when the participant is near the treasure around 50 meters. 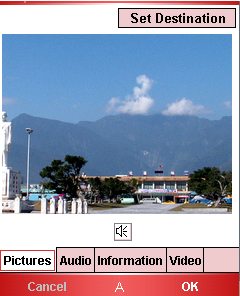 The game interfaces include different aspects, such as the features of the scenic spot, audio guides for natural terrain, and quizzes. Consequently, the students can observe the geographic environment near the treasures, culture, and food and answer the quizzes to build up a personal database. Moreover, in this game, each student should have a handheld GPS as a treasure hunting tool; a handheld PDA equipped with GPS function would be better. The executability of the activity should be concerned in designing Treasure Hunting Game. Therefore, the campus environment and local environment off the campus both can be adopted. The former is more suitable for beginners; the obvious buildings and landmarks in the campus, such as gate, playground, flower beds, gym, educational building, parking lot, etc can be the places for hiding the treasure. However, the safety should be concerned as well so that construction sites or some places with potential dangers should be avoided. In designing treasures, the treasure can be an object or the place itself. Once the participant is approaching the target, the system will automatically show the quiz. The quiz should be related to the treasure. For example, when the participant is approaching the flower bed, the system can appear “What kind of flower is it?” Thus, the participant needs to answer the question in this game. Since the treasure hunting game integrates spatial map data, the system can display the places for the treasures according to the order you set. Also, the system can indicate the distance and the direction to the next scenic spot to clear up the participants’ confusion and to effectively mange the activity area and time (the figure below). As the treasure hunting game is finished, the system can automatically calculate the participants’ scores, which can be referred to how the students understand the quizzes. Also, you can apply other evaluation factors, such as answering time, the speed of finding the coordinates to be the evaluation criteria. Furthermore, the distance between each treasure should be designed carefully; neither too far nor too close is appropriate. If the distance is too close, it would be hard to tell how the students understand the quizzes; if the distance is too far, it would be difficult for the participants to find the direction to the next treasure. If the activity is held off the campus, the activity area should be concerned in designing the game. In general, public parks and scenic areas can be the activity area. If all of the conditions are met, the activity can be more flexible. For example, the participants can spend a half day finding the places of the treasures by bike. As a result, the activity area can be extended. Similarly, the rule of the game is to answer all of the questions in the system. No matter the activity area is in campus or off campus, the design of the questions should focus on the information which can be received by sensory organs. The questions for off-campus activities can be related to the local features, such as visiting historical sites of Qing Dynasty, seashore recreational route, historical architectures in old streets. On the other hand, the questions for the activities in campus can refer to the existing information in the campus, like the placard of flora and fauna, narration of special scenic spots, etc. The activity time can be decided by the number of treasures and the area of the activity, but it had better be less than four hours. If the time is too long, it might reduce students’ motivation of treasure hunting. The database of treasure hunting game system contains three parts, treasure location database, map basic data, and quiz database. Since each treasure location has geographic coordinates, the quiz can automatically appear when the participant is approaching the treasure. The map basic data apply a desktop geographic information system, such as SuperGIS Desktop 2.2 as a platform for creating maps. Then, according to the activity areas, you need to create different maps; for example, the activity held in campus needs to create maps with main buildings, educational buildings, libraries, etc. For the off-campus activities, the maps with main landscapes, roads, rivers, etc are necessary. The number and levels of quizzes can be arranged by database, and the system can select the quizzes randomly. Therefore, each student might have different quizzes; various relevant quizzes can be designed for the same treasure location. Besides multiple choices, the question type can be fill-in questions with pictures; for example, the system displays the picture of the plants, and the students need to fill in the question. The set of Treasure Hunting Game adopts SuperGIS Mobile Engine 3, the mobile GIS application SDK (Software Development Kit) as the core object and applies the highly-flexible development mode and complete object controls of SuperGIS Mobile Engine 3 to assist developers in developing intuitive and desired game program. Treasure Hunting Game not only remains the concept of hunting treasures with maps but also integrates GPS function. With a designed route for treasure hunting, the students would not miss any places for treasures. During the process of game, students can participate in the activity and observe the environment in person and absorb the knowledge unconsciously. Meanwhile, students can learn how to apply GPS and the skills of reading maps to obtain the knowledge happily.